Brilliant and Zena win 2017 Pat West Gaff-Rig and Schooner Race. 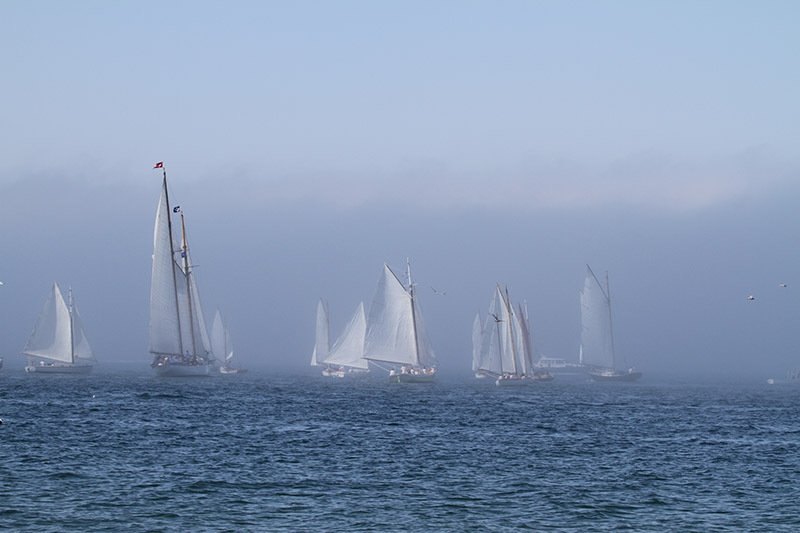 As the fleet of gaff-riggers and schooners edged into the looming bank of fog, Skip Richheimer decided that his strategy for Saturday’s 29th annual Pat West Race was to sail as closely as he could to Nat Benjamin’s schooner, Charlotte. In the end, his 18-foot catboat, Zena, beat out the 50-foot Charlotte as well as the rest of the fleet to take the gaff-rig division honors. 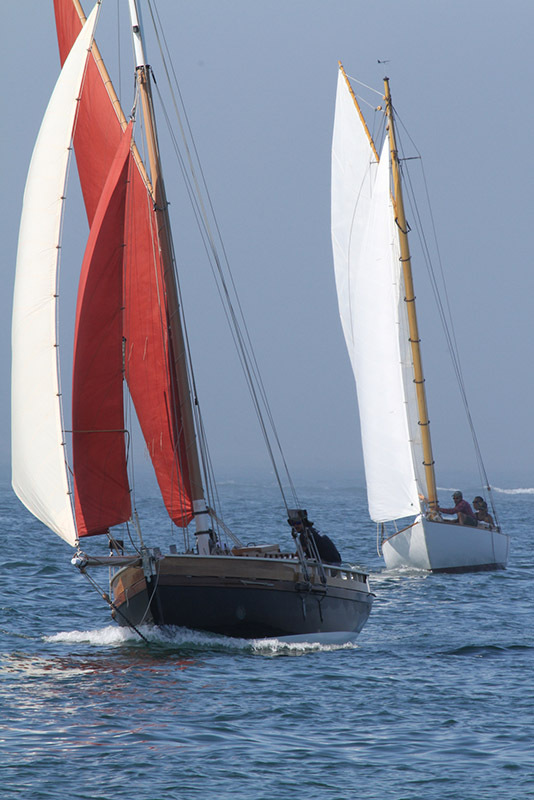 In the schooner division, rivals Juno and Brilliant were closely dueling until they lost each other in the fog. When the fog cleared, Brilliant found herself alone, ahead of all other boats, and able to ride the current dead downwind to the first mark, the big bell off Nobska Point, which in time became the finish line. Brilliant took line honors, and also finished first on corrected time in the schooner division in the shortened race, winning both the Zeb Tilton and Ingrid Robinson trophies. 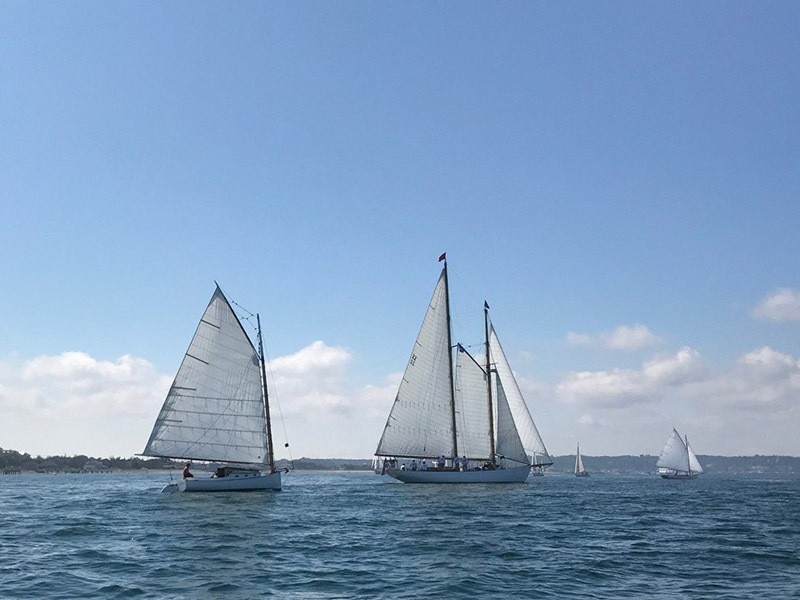 A lively, end-of-summer tradition that now benefits Sail MV, the 2017 running of the Pat West Race drew a strong fleet of 27 of the traditionally rigged vessels. Most of the boats were wood, and nearly half came from the boatbuilding shop of Vineyard Haven’s Gannon and Benjamin. However, this year’s race involved an eerie and challenging combination of light wind, strong current, and heavy fog. Thirteen of the boats did not finish the race, turning back at various points along the course. The 14 schooners, yawls, ketches, sloops, and catboats that persevered experienced the tests of sailing in slight and fluky breezes, currents that could easily push a racing boat far below the rhumb line of the course, and a long stretch of sailing by compass, GPS, and sound with no sense of where competitors were. From aboard the 29-foot Gannon and Benjamin sloop, Lisca, last year’s winner of the gaff-rig division, Angie Park-Sayles reported that they could see “beautiful ghostly boat shadows appear and disappear amid the sounds of blowing fog horns (and a conch shell! ).” In time, the fog lifted, but the whispering wind wholly died off. For a while, under hot sunshine, there was swimming, fishing, and a skinny-dip or two, and at least one schooner anchored before the wind again filled in. 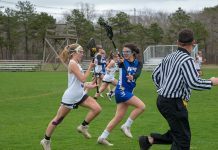 With a forecast for winds of only five knots, the fleet headed out late Saturday morning to the starting line off Eastville Beach under sunny skies and no wind. One small catboat, engineless, anchored after being towed out to the starting area. 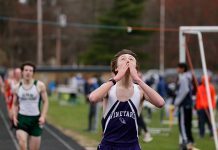 The race committee, led by Doug Heil, chose a short course of 10.5 nautical miles, crossing Vineyard Sound to Nobska, a short leg up the Falmouth shore, and return. But then the start of the race was postponed for 30 minutes. By then, the wind had picked up, and the race began with encouraging prospects and a closely packed fleet. Slowly, boats began to fade into the bank of fog that lay off West Chop. 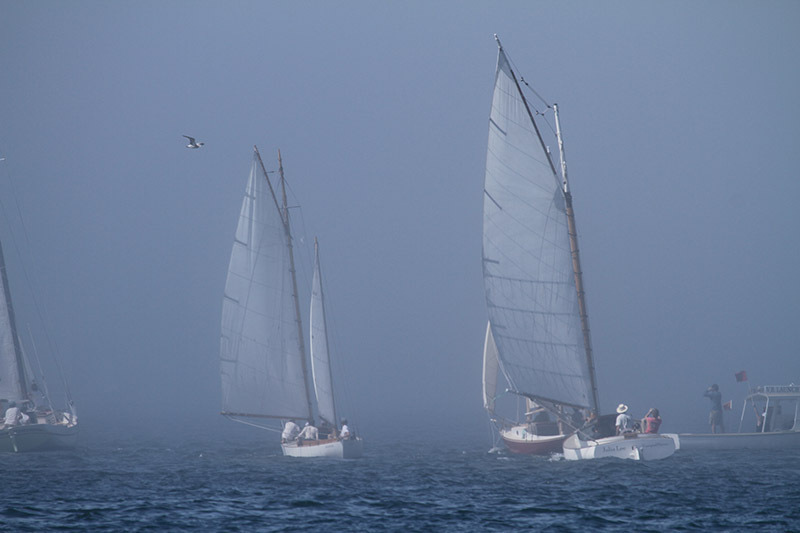 With the fleet lost in the fog, the committee boat began to broadcast the possibility of a shortened race, asking competitors to take their time at a finish line positioned at the Nobska bell in case that became the race’s finale. The schooner Brilliant, having emerged from the fog surprisingly close, took a full-standing jibe to cross that line, sails all aback and drifting with the tide. Captain Alley informed the committee boat of her finish time, and only later found out that the race had been officially shortened, which gave Brilliant her second Pat West victory. Skip Richheimer’s Zena came out of the fog still near Charlotte, north of Middle Ground, then slowly passed Charlotte and other nearby vessels, catching wisps of wind and finding favorable currents to bring her across the line second in the whole fleet and first in her division. 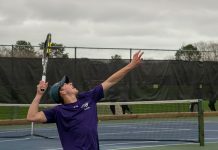 Zena was followed by two Gannon and Benjamin Bella-class sloops, Minnehaha, skippered by Lyle Zell to her second straight second-place Pat West finish, and Sparrow, handled by Seth Salzman, in third. 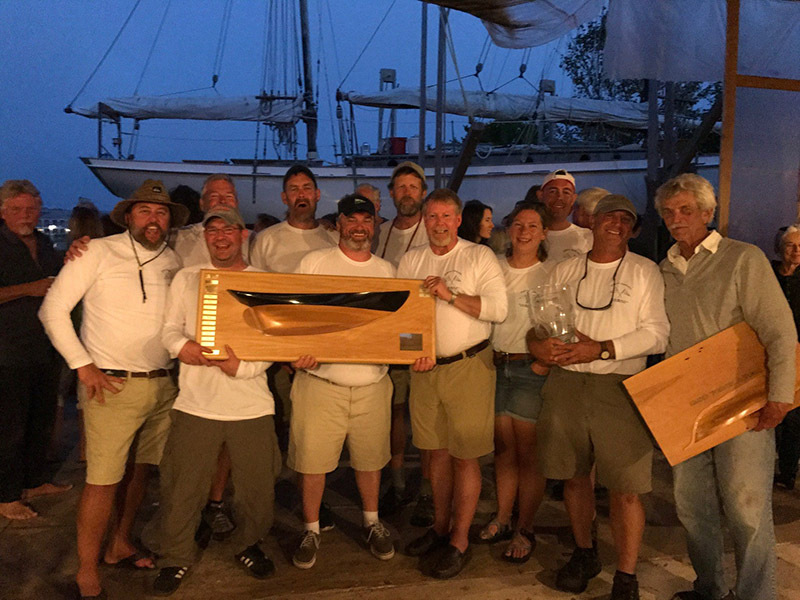 In the schooner division, Juno, with Captain Scott DiBiaso, placed second, and the visiting Towny, a Tancook Whaler from Woods Hole skippered by Gannon and Benjamin shipwright Athena Aicher, took third.